Tech N9ne’s appearance on MTV2’s Hip Hop Squares had everyone in Strangeland glued to their screens as they waited to see what the Kansas City King would do on the cable network. Joining a cast that included Machine Gun Kelly, Fat Joe, DJ Khaled, Kat Graham, and more, Tech N9ne took his spot among the squares and kicked off the first episode of the brand new season. 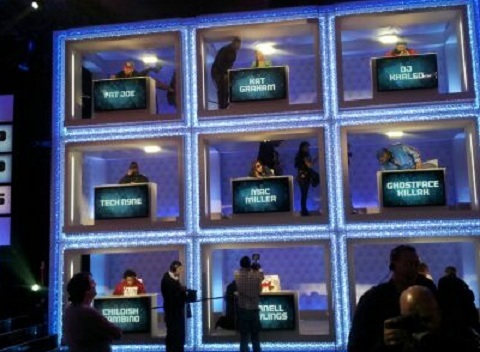 Like the original Hollywood Squares, there’s never any guarantee that contestants will pick every square during gameplay. While most Tech N9ne fans voiced their opinions on his absence during the actual game, Tech hit the web to assure everyone that there’s still plenty more to come from him on Hip Hop Squares. Check out what Tech had to say below! Will you be tuning in to see Tech’s other appearances on Hip Hop Squares?